Although I got the chance to go hands-on with The Surge, there was certainly no hand holding. Almost immediately after waking up amongst a massacre of man and machine, I was left blurry eyed as a small drone attempted to remove my leg. That was my introduction to the game. It’s a fairly jarring moment but one that plays into the central and familiar ambiguity of The Surge. 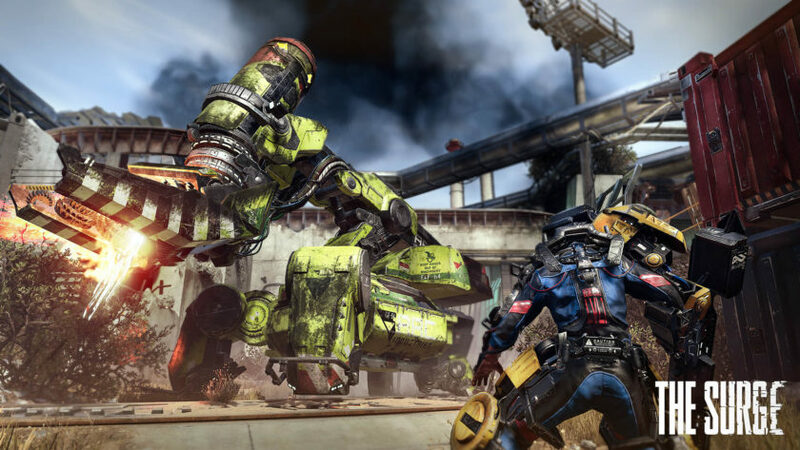 To say that The Surge is a sci-fi variation of Dark Souls would be lazy journalism and pandering to the constant notion that every game of this generation is one form or Dark Souls or another. Luckily for me, a developer said it instead. 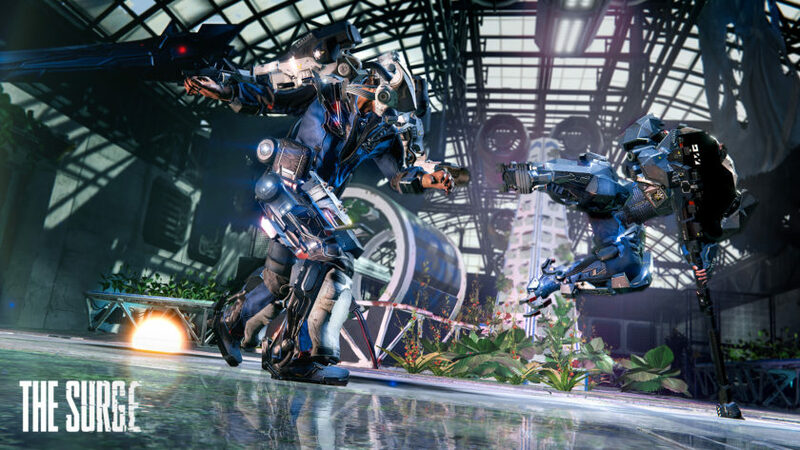 The Surge is a game that has taken the core mechanics of Dark Souls and managed to transplant them into a dystopian, crumbling science fiction setting. 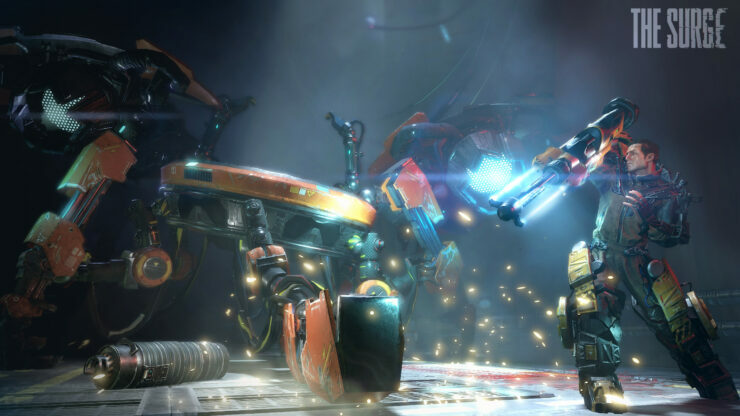 You play as a manual laborer, whose augmentation with an exo-suit goes horribly wrong. For unclear reasons, you find other exo-suit clad workers have seemingly lost their minds, while automated robots attack with equal hostility. Left to survive in this unforgiving environment, you must explore and overcome the world around. And what hit me first, apart from the evil robots, is the environment itself. The amount of detail that immediately surrounded me was staggering. Like Dark Souls, the player is left to discover the story on their own. The area I explored was some sort of junkyard outside of a sprawling factory. Examining the discarded aeronautical equipment might have offered some clue to the narrative, but I wanted to spend as much time in The Surge as possible dying, of which I was very successful. Combat in The Surge will be similar to anyone who played Dark Souls, or Deck 13’s own Lords of the Fallen. However, there are some creative additions that make the game stand apart from those games. Each weapon you come across has a unique and weighted feel to it, and you’ll have to manage your stamina with precision if you want to survive even the easiest encounter. Where The Surge breaks away from that formula is in its ability to target specific limbs. Most enemies, at least the earlier ones that I encountered during my playthrough, are armored in certain areas. Choosing to attack vulnerable limbs will do more damage, but there is an advantage to attacking armor. Killing an enemy through armor allows you collect blueprints that can you use to create the armor for yourself. Better yet, attacking the weapon arm, while entertainingly gory, lets you steal the weapons once they are dead. Rather than needing to grind against enemies hoping to drop their weapons or armor, we can finally target that specific gear we so desperately crave. The weapons themselves are a visual blend of scientific machinery and heavy duty metal. Starting with the humble metal pipe, you can quickly find (on the corpses of your enemies) some impressive tools of destruction, such as a chainsaw and pneumatic power tools. Each weapon has it’s own move set and you’ll have to find the best weapon to fit with your specific playstyle. From here the game follows in the gratifying footsteps of Dark Souls. Players are brought to a medical bay with each death, which seemingly mocks you each time you leave. From there you are encouraged to tentatively explore the environment around you, finding alternate routes and shortcuts that help you slowly progress through the world. During my short time with the game, I found a hidden dark passage that forced me to equip a weapon that produced some light, as well as a huge, punishing car crusher-esque machine just off the beaten track. There are multiple routes and various inaccessible locations that tempt you into returning later on, though it won’t make the combat any easier. Where the biggest difference comes from, is how the game forces the player to balance its equipment. Instead of traditional levels and stats, player progression is through the upgrade of their power core. Each piece of armor, weaponry and implant costs a portion of your available power. The more power you have to negotiate with, the better equipment you can use. And to level up, you’ll have to carry your experience back to the medical bay. Of course, if you don’t make it back in one piece you can always retrace your steps and find them again. But unlike Dark Souls, you’ll have to find your experience before the timer runs out. Each kill you make adds to the timer, so you’ll have to be sensible with your route and effective with your combat. The game is due for release in May on PC, PlayStation 4 and Xbox One.